We discovered a beautiful city which has loads of tourist attractions nearly all catering for kids. An added bonus is that most of the National buildings and collections are free to enter meaning you can visit Canberra with kids quite cheaply. 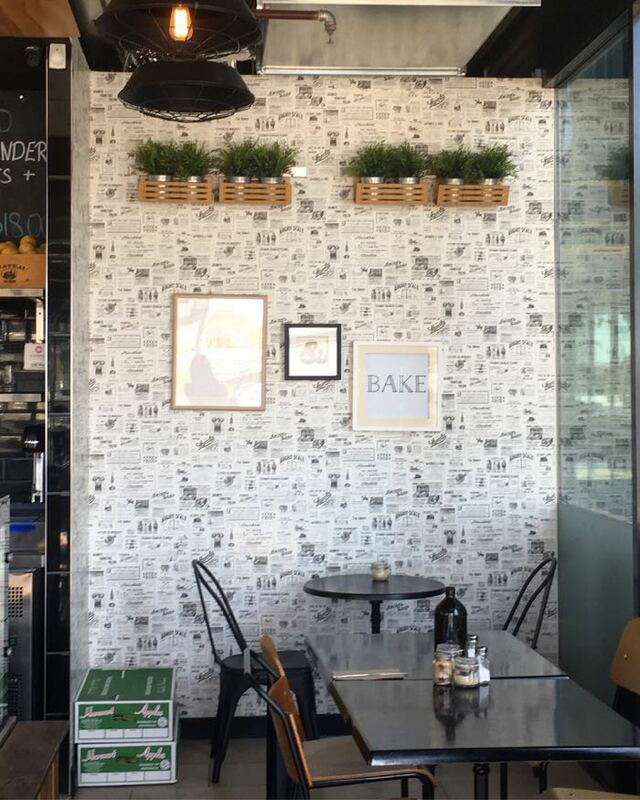 As a family who loves to eat out, we were excited to find Canberra is also a great city for foodies. You’ll find funky cafes and cool restaurants dotted all over the city. We had the best family holiday here and almost ticked off our entire bucket list which I’m sharing with you. We can’t wait to head back with our boys to see more. When I ask my boys “what was your favourite thing to do in Canberra?” they tell me Questacon! With multiple levels of interactive hands-on activities you can spend a whole day here. My boys particularly enjoyed The Shed where they could race cars down tracks and construct something out of wood. 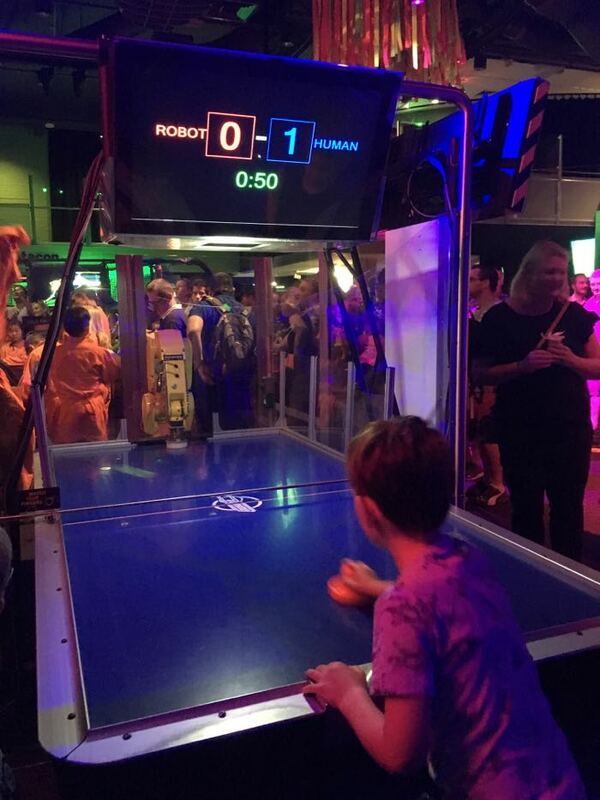 Battling a robot in a game of air hockey (and winning!) was also a highlight for my eight year old. Keep a look out for the variety of science shows on throughout the day. We chose ‘Instrumental as Anything’ which was very entertaining and a chance to learn loads about sound. For pre-schoolers make sure you grab a ticket for a time slot at Mini Q. Toddlers would love the construction zone with ‘bricks’ and pulleys and the water play set-up was very impressive. We loved how your entry ticket allows you to come and go throughout the day. To be honest I’d never heard of an Aboretum. We came here for the pod playground but learnt an Arboretum is a botanical garden mainly made up of trees! There were loads of people due to the Easter public holiday however my boys still enjoyed exploring the pod playground. 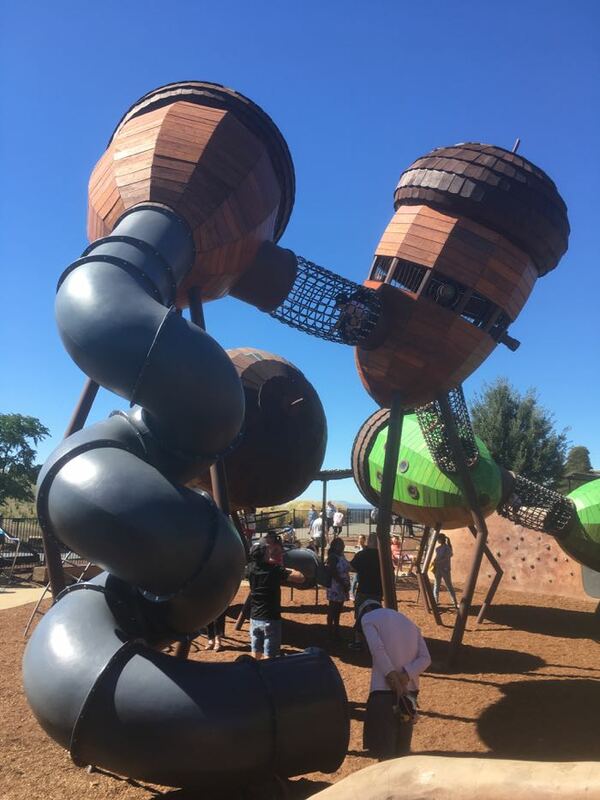 You’ll find a toddler zone including sand play at one end of the playground, climbing nets for bigger kids at the other and slides coming down from the cool pods in between. I loved how this play space is fully fenced and just a short walk from the carpark. Afterwards we headed inside for a sandwich at the cafe where there’s a food court type set up. 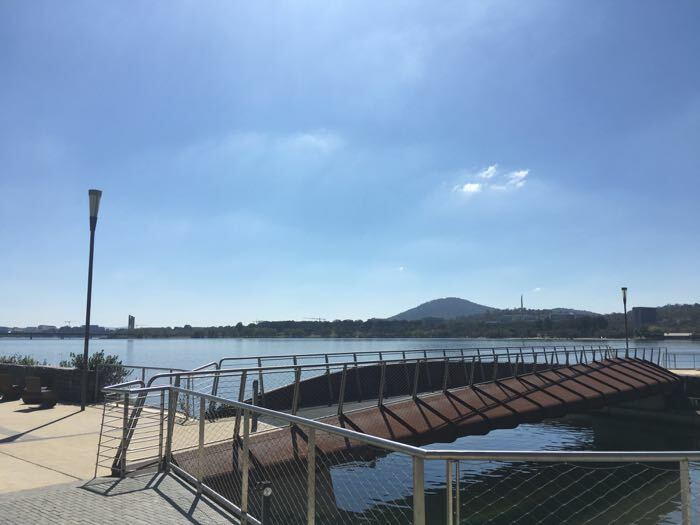 Here you can sit and enjoy the stunning view of Canberra and beyond. Be sure to head outdoors to the amphitheatre where our boys went crazy running and rolling down the steep grassy hill. Be warned getting back up was not so fun for my little dude who apparently doesn’t like climbing hills! We loved how you can also take a drive within the Arboretum to see various outdoor art sculptures and amazing views of the city. Just pick up a map indoors if you’re interested. It surprised me how interesting it was to explore the nearly eighty embassies and high commissions in Canberra. We were glad we took a casual drive here before dinner one night as it allowed us to get a sense of what Canberra is like just out of the city. My boys found it fun to guess which embassy we were looking at as we drove past, before finding a sign to see whether they were right! Almost all of the embassies resemble their country in some way from the traditional design of the Chinese embassy to the huge Georgian style United States Embassy with security at the gates! 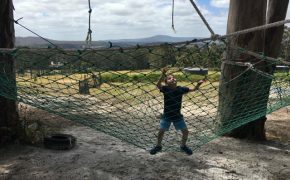 A unique and educational thing to do when in Canberra with kids. 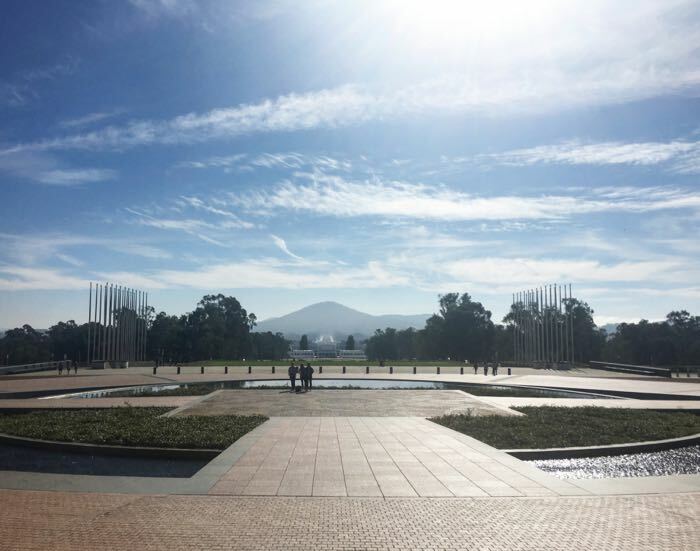 Visiting Parliament House was a must for us when in Canberra. Our boys enjoyed briefly visiting a building they knew was special. The fact that you had to go through “airport security” to get inside added to the excitement for them. Once inside we took a walk around stopping at a table where a ‘design your own rug’ activity was set up for kids. Be sure to take the lift up to the rooftop where you can get a spectacular view down to Old Parliament House and beyond to the Australian War Memorial. We stopped at the shop to get a special souvenir badge on the way out which my little dude is still wearing on his jumper! Just a twenty minute drive out of Canberra will take you to the suburb of Kambah. Here there is a massive playground where you can picnic while the kids burn some energy. 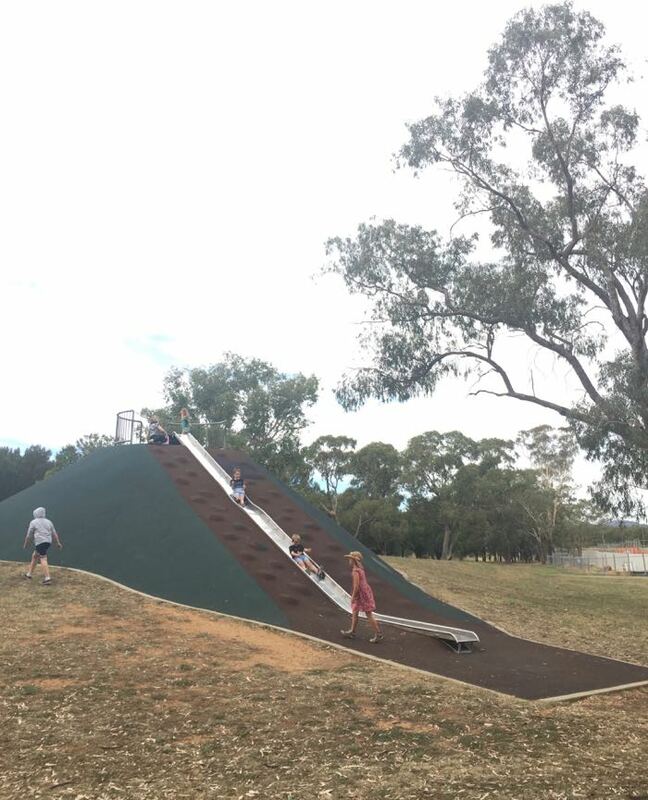 There’s something for all ages however the bigger kids can enjoy old-school equipment like flying foxes, extra long swings and slides built into hilltops. Our competitive boys loved repeatedly racing each other down two slides which were side by side. It’s the small things! 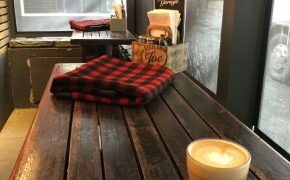 If you’re after a coffee or meal with a view then head to the impressive row of modern eateries at Kingston Foreshore’s waterfront. This is the perfect spot to relax and take a walk along the water. I’ve been told by one of my followers who is a local that the Canberra Glassworks have exhibitions and glassblowing demonstrations which are well worth a look. I’ve also heard checking out the stall’s at Sunday’s Old Bus Depot Markets (next door to the Glassworks) are a must-do on a Sunday. Unfortunately we couldn’t make it to either but they’re on the bucket list for our next visit. One of our favourites. Lake Burleigh Griffin is stunning and offers many spots to get outdoors and explore Canberra on foot or bike. Many of the main attractions and iconic buildings are dotted around the lake. Be sure to head to the Captain Cook Memorial Jet that intermittently sprays water high into the sky. Our boys saw the water in the sky from a distance and were excited to take a drive to see it up close. We’d love to come back and take a boat ride on the lake next time. 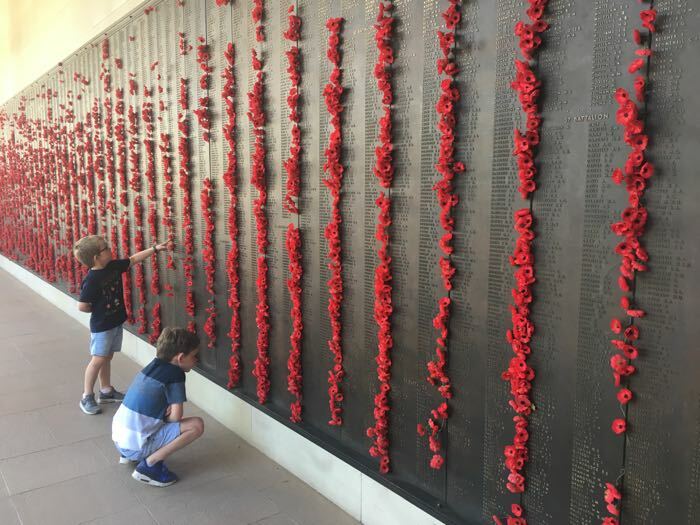 It was a very special and memorable day visiting the Australian War Memorial in Canberra with kids. There’s loads to see besides the memorial itself however with kids in tow it makes it tricky to look at all the galleries and exhibitions. I was impressed to see there is a kids discovery zone with trenches to climb in and a real Iroquois helicopter to ride. Our boys enjoyed wandering and looking at the outdoor memorial and my little dude had fun scanning for underground mines in the kids discovery zone. There’s also a lovely cafe on site which had great coffee, babycinos and freshly baked scones. We were lucky enough to be there when a table of local ladies were making crocheted poppies for the upcoming Anzac Day service, which added to our experience. We’d love to come to an Anzac Day service or last post here when our boys are older. Pile on your winter woolies and head along to GIO stadium to watch the local Brumbies play. We timed it well in that they were playing the New South Wales Warratahs when we were here. GIO Stadium is super easy to access when driving from the city. It’s also a small stadium so it’s the perfect opportunity to get up close to watch a super rugby game with great atmosphere. 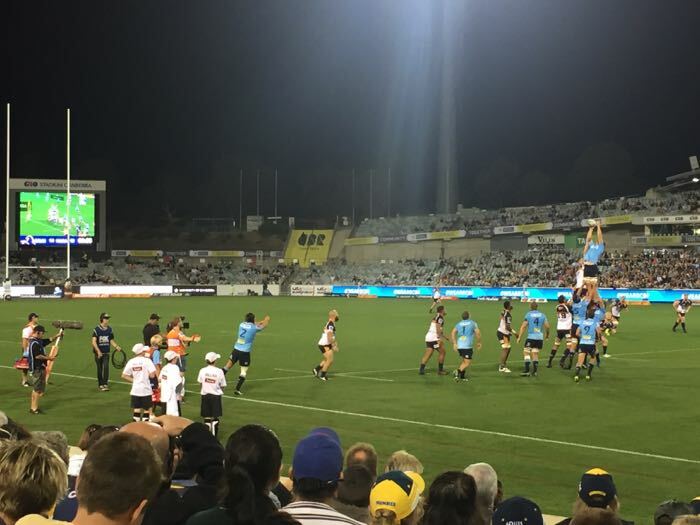 Watching a live game of rugby union and the hot chips to go with it were one of the Canberra highlights for our boys. Did you know there is a growing collection of around 3500 works at the National Portrait Gallery? All consist of individuals who have contributed to Australia as a nation in some way. As a lover of photography I found this gallery really unique and fascinating. Our boys however were a bit young to appreciate it and unfortunately there were no kids activities at the gallery to keep them occupied. This is on our list of places to come back to in a few years time. We headed to this vibrant strip of restaurants for dinner one night and really enjoyed the atmosphere. There was no kids menu however our boys shared a plate of delicious fish n chips which was the perfect size for them. There was live music on the night we were there and we managed to find a table without any difficulty. Seating is both indoors and outdoors on the pavement. 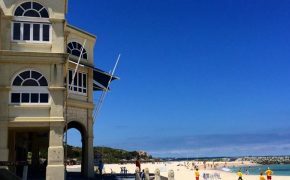 Located on the foreshore with indoor or outdoor seating and a water view, we loved this cool cafe. We were all very happy with our choice of lunch which included fresh salads and sausage rolls, smoothies, and hot chips for the boys. The coffee and babycinos were on point and sadly I had no room left for the sweet treats inside which looked amazing. One of our favourites which again didn’t disappoint. We were glad to stumble across it in Canberra as we know our boys enjoy the burgers here. Located in the same strip as Public, this is a great location to eat out as a family. They have kids meals which include a boxed mini chicken or beef burger, chips and a drink. I love how they also come with a small kids activity which always keeps our boys occupied at the table. We opted to stay in a hotel room with our boys at the centrally located Crown Plaza. The room contained two double beds and a bathroom with a lovely park view. The park has a cute little playground and plenty of grass for the kids to get out of the hotel room for a run-around. We discovered it’s also a popular spot for locals on the weekend. Our boys had some free entertainment from the window in the form of drones flying and martial arts practice allowing us to chill out! We had a very impressive buffet breakfast included in our nightly rate which our boys always love. It filled us all up for most of the day which is always a good thing when you have no kitchen facilities. The Crown Plaza is walking distance to the city centre however a car is needed to visit the tourist attractions. There’s an impressive pool which we attempted to swim in but it was far too cold for our Autumn visit. 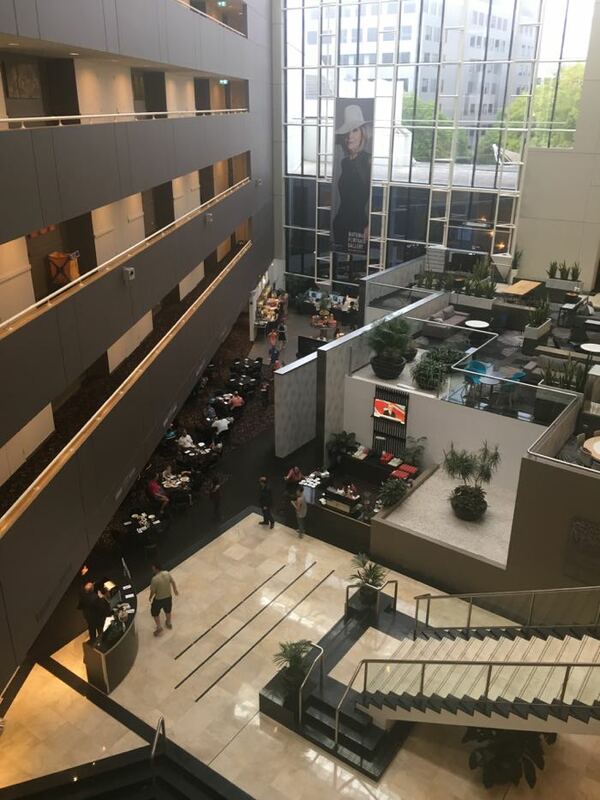 We really enjoyed our stay and would recommend this hotel accomodation in Canberra with kids.